50 powerpoint presentations each contain 10 questions which appear on the screen at 15 second intervals (this time interval can be altered to suit your class if necessary), and at the end the answers appear, so that written answers can be marked. They can be presented to the class as a conventional powerpoint presentation, in which pupils read the questions themselves. If desired the teacher could also read out the questions to the class. Click hereto download a sample (The actual files are fully editable powerpoint presentations). 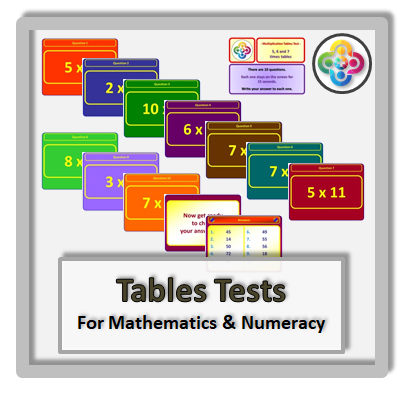 These tests can be used for pupils of any age or ability.